Join the discussion on our forums! Come discuss Chittering Tunneler over in our dedicated Chittering Tunneler discussion topic. With rotation and warlock getting a lot of good cheap spells, this card became real good, especially in Handlock with Hooked Reaver and Lesser Amethyst Spellstone. Soon people will realize that. In my opinion, Chittering Tunneler doesn't seem as horrendously bad as people think it is. I've actually made a weird Renounce Darkness deck in Wild and I had two of these fellas and used them having in mind that I could have something to play in later turns or instantly, depending on the spell I'll discover. Sure, sometimes it's a risk to run this card, because the discover effect could discover some really heavy cards, having as a result to damage your hero badly due to the discoveries, but you could use some cards with healing effects such as (in Wild): Reno Jackson, Antique Healbot and Refreshment Vendor, and in Standard you could use the neutral healing cards like Earthen Ring Farseer, Sacrificial Pact, maybe Voodoo Doctor but if you don't want to have one of these cards in your deck, you could use a Violet Illusionist or even two, if you want to nullify the downside of Mr.Chittering Tunneler over there (and don't take damage from your Hero Power, since you'll be immune in your turn while Violet Illusionist is on the board). Hearthstone needs more "cost" introduced to discover so that the opposing player can make a guess on which card was discovered and play around it. Cards like Primordial Glyph with no "cost" to them are just bad design as it gives the opposing player no chance to interact at all. I like the art of this little fella, and although he isn't the best of cards, he's found a good place in my deck. if he could choose from all spells instead of just Warlock ones, he'd be a lot better though. Long story short: too much of a gamble. Discover a Twisting Nether or DOOM! is hilarious. Poor Warlocks... Bad card. Imo this has potential to be played in constructed, it's not so bad, as people think it is. Explanation: Now many people may disagree and won't take it serious, but imo this card can find a home in zoolock or maybe in disco, when you need to throw an useless card away. It's another thing whether or not zoo and disco desperately need that card, but who knows. The reason for this is - a not so great statted minion, that however gives you a spell. And that's important to mention, because in those type of decks people don't run spells at all (almost; with the exception of Soulfire and Forbidden ritual). So this card counts as two - a body + a "free" spell. And I purposely call it free, because these type of decks don't really care about healing or dropping that low on health. You don't care about the late game - you need to rush down your opponent as much as possible. There are spells, that you will find useful, if you discover them: Bloodfury Potion, Soulfire, another Forbidden Ritual, Mortal Coil, Shadow Bolt - also a good option, maybe Kara Kazham! and Feeding Time, you can even find a removal, if you are desperate to remove a big taunt or so. In wild there are even more and better options. Since with the hero power you are "diggin" for answers, this card will come in handy. Note: Because there aren't any good healing options in standard, this card will be risky in the handlock deck. The health price will be too much to pay and it won't be worth it + why run a risky card, than can damage you and end the game in favour for your opponent, when you can include the spells instead. what healing does warlock have that you would use? It's more easy to explain in wild - Antique Healbot, Refreshment Vendor - these cards heal for bunch and synergize well with brann. If you are a fan if reno, then he is an option too. The healing is really significant in order to sustain your hero. Because the taunts only block future physical damage (aka minion's or weapon damage). In standard you can heal with Earthen Ring Farseer and Mistress of Mixtures - those are the best options. The other healing neutral minions are either not worth it to include Gadgetzan Socialite for an example, or super conditional, like Cult Apothecary. If you run Kabal Courier, you have a chance to discover a priest healing card, but it depends on RNG. So if I could make a good neutral healing card, that would be used by warlocks and other non heal classes, it would definitely be a version of Jinyu Waterspeaker. If this is not what you were asking, then please reexplain your question. 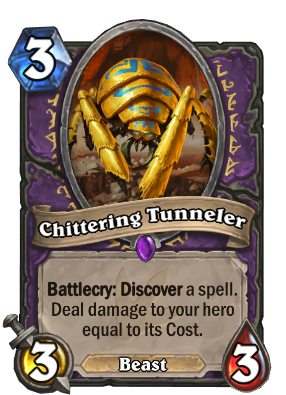 Note: Although there are better healing options in wild, I would still not recommend using Chittering Tunneler in anything but disco/zoo. Handlock doesn't need a card, that will damage himself, because that deck normally uses expensive ones (removals are relatively costly) and the bigger the cost, the bigger the damage from Tunneler + you have to pay the price of casting it too. And also why would you include a card, that won't always give you the needed answer, it's better to include the spells themselves, rather than an additional minion. But the card isn't bad on its own - I tested it in arena and the results were pleasing. In the games, where I rushed down my opponent, the Tunneler came in handy. Good analysis. This card is terrible when you're fishing for answers. Instead, play it to proactively get some low-cost answers. Also wanted to point out that Violet Illusionist and Lord Jaraxxus can be used to mitigate the damage. I toyed with a self-harm deck using all of these. It was bad, but not as bad as it looked at first glance. Also wanted to point out that Violet Illusionist and Lord Jaraxxus can be used to mitigate the damage. This card is terrible when you're fishing for answers. Instead, play it to proactively get some low-cost answers. that's why only fast decks should use it, because they don't run that much spells and this card can give them something they need - either burst, removal, minions etc. Huh? You're the one who made the case for Chittering Tunneler plus a heal card. I was just chiming in with more options. The nice thing about these two is that you can afford to reach for a more expensive spell. Fast decks can't afford to put in things like Siphon Soul or Bane of Doom, but you'd be happy to pick one up if you happen to have the Tunneler and Illusionist together or if you plan to use the Lord Jaraxxus on your next turn. Of course, this wouldn't happen in a zoo deck, but maybe a mid-range deck could get away with them. Uhm ... I didn't mean that. I was looking at the double price - the health + the mana one - and I mentioned that the health price is not worth in a slower deck. Especially in a one, that uses the hero power and other damaging spells to maintain board control. I mean you can heal, but why not just include the spell you need, instead of risking it. Same thing for the Illusionist and Lord J. Sometimes you may not have the mana to use her, and most importantly I don't think that this combo is really worth it. I understand that it nullifies the damage, that together with Bloodbloom will make cool combos, but if we look at a more competitive match, you won't always have the possibility to play the combo. And sometimes when you do, you might end up getting cheap, useless spells, that you don't need at the moment. Or you played two minions, just to get one card, that if it's an expensive one can only be used on the following turn. Like I said control locks are better with including the spells instead. Btw fast decks aren't afraid of taking damage. If they are fast/aggressive enough, then the opposing player will be forced to play defensively, meaning that they won't aim for the face for a while, if you aren't low enough. What I mean by that - even zoo or disco zoo can afford to take the damage, even if it comes to choose an expensive card; they are just not afraid of it. They are the ones with the burst potential and every spell can help them with it - even a removal against a taunt. Inb4 picking a Siphon Soul at the end will just do 3 damage to you (because it heals you for additional 3 points). I read that you wanted to say how a mid-range deck would use the Illusionist together with a tunneler, but i wanted to point out how the damage is irrelevant to aggro decks. Hence PW sometimes wants to go really low, just to activate Mortal Strike. play it to proactively get some low-cost answers. Let's look at the cheap spells. Soulfire may help you with clearing a minion really cheap, but it will discard you a card. And if this card is a removal or a taunt, they you will have a bad time as a control lock. The other cheap spells, a control lock can use, are Mortal Coil, Shadow Bolt, Corrupting Mist and Drain Life maybe. In wild you have Power Overwhelming as well. BUT if you look at the other cheap cards, then you will see, that mainly zoo and disco zoo benefit from them - Forbidden Ritual, Bloodfury Potion, Demonfire, Sense Demons, as well as the cheap spells mentioned above. So in conclusion Tunneler is only useful in those type of decks. Control locks and value locks can use Kabal Courier instead. Isn't that basically the same as being immune during your own turn e.g. Violet Illusionist?